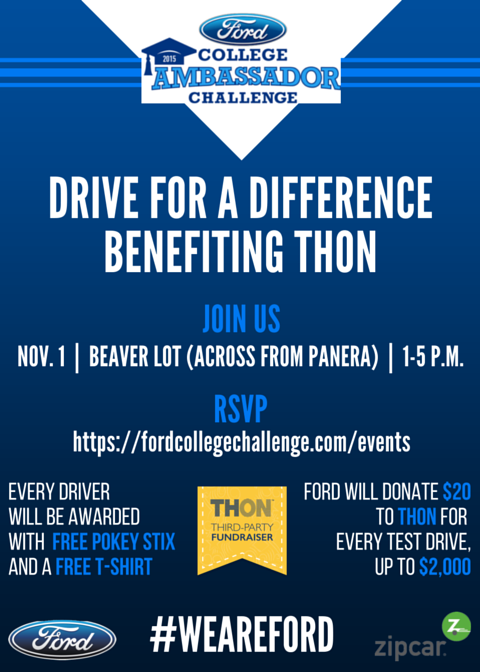 If you’re looking for a fun event that benefits THON, than the Ford College Challenge Drive for a Difference is the perfect one for you. The Ford College Challenge has nine universities nationwide competing in three challenges to market Ford and Zipcar on campus. So where does the fun come in? Any person who is currently residing in the State College community and is at least 18 years or older can test drive a Ford Zipcar any time from 1-5 p.m. on Sunday, November 1 at the Beaver Lot across form Panera. For every person that test drives a vehicle, Ford will donate $20 (up to $2,000) to any THON organization or independent dancer couple. In addition to benefitting THON, the We Are Ford, Penn State team is providing FREE t-shirts, pokey stix and music. Participants will be offered free registration to Zipcar which allows access to all Zipcars and includes $35 in free driving. Participants are also encouraged to bring friends along with them for the ride. In order to participate, you must bring a valid driver’s license and register at www.fordcollegechallenge.com/events. Scroll down to “Pennsylvania State University,” and fill out some basic information. Participants must also sign a waiver once they arrive at the event. Any further questions can be sent to Rachael David at rachaeldavid12@gmail.com. There is also a Facebook event which can be found HERE. What better way to kick off the THON soccer game than raising an easy $20?